Two good clocks will show different times in outer space and on Earth. Gravitational time dilation is a physics concept about changes in the passage of time, caused by general relativity. A clock in outer space moves more quickly than a clock on Earth. Heavy things like planets create a gravitational field that slows down time nearby. This means that a clock on a spaceship far away from any planet would move faster than a clock near Earth. This is different from time dilation explained by special relativity, which says that fast objects move more slowly through time. Close satellites like the International Space Station move very quickly to orbit the Earth, so they are slowed down. 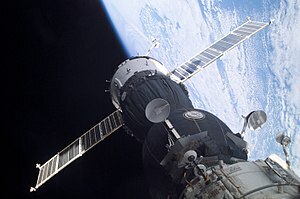 Because the ISS is in low Earth orbit (LEO), time dilation due to gravity is not as strong as time dilation due to its speed, so a clock on it is slowed down more than it is sped up. An object in Geostationary orbit moves less quickly and is farther away from Earth, so gravitational time dilation is stronger, and clocks move more quickly than in LEO. This means that engineers need to pick different clocks for different orbits. GPS satellites work because they know about both kinds of time dilation. ↑ Ashby, Neil (2003). "Relativity in the Global Positioning System". Living Reviews in Relativity 6: 16. doi:10.12942/lrr-2003-1. http://relativity.livingreviews.org/Articles/lrr-2003-1/download/lrr-2003-1Color.pdf. This page was last changed on 12 July 2017, at 06:41.